Hi Friends. Tonight I was blessed to serve alongside a wonderful organization, Feed My Starving Children. Check out their statement of faith. I went with a group of friends and together with an amazing group of volunteers packaged about 10,146 packages of: Rice, Extruded soy nuggets, Vitamins, minerals, vegetarian chicken flavoring and lastly Dehydrated potatoes and carrots. The boxes we filled are being taken tonight to the port of Miami and taken straight to Port au Prince, Haiti. It was an awesome time. Hi highly recommend that you take a look at their website and prayfully consider partnering up with FMHC. I pray that you have not forgotten the people of Haiti. Continue to fervently pray for them, that they may taste and see that the Lord is good. Pray that they may experience the love of our amazing God- Father, Son & Spirit. Please pray for my friends Carlos, Eugenio and the team serving with them in Haiti this week. They arrived today. Prayer moves the hand that moves the world. 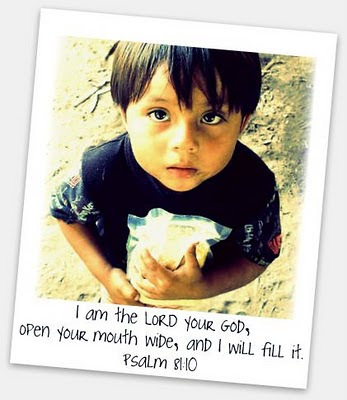 PS- Check out FMSC on Facebook and Twitter.